HERE’S a way to actually enjoy cutting the grass… use a 130hp, 1000cc V-Twin-powered 100mph lawn mower. Yes, we checked the date on the press release a number of times and April 1 couldn’t be found anywhere. Honda UK has published a press release about the one-off Project mean Mower, built by its British Touring Car Championship partners, Team Dynamics, to create what’s believed to be the world’s fastest mower. The Birth of Mean Mower Team Dynamics re-engineered a Honda HF2620 Lawn Tractor from the ground-up, adding an all-new fabricated chassis, custom-made from 4130 chromoly, to provide a strong, safe but very light platform. A 1000cc engine from a Honda VTR Firestorm was used, along with a bespoke suspension and wheels from an ATV. Every effort has been made to retain as much of the look of the original mower as possible. The cutter deck was custom-made in fibre-glass, to reduce weight, while, in a stroke of pure genius, the grass bag provides a happy home for the fuel tank, a high capacity oil cooler and a secondary water cooling radiator. The ability to still cut grass was also a key element of the brief, and the super-fast mower still can, admirably, thanks to two electric motors on the cutter deck, spinning 3mm steel cutting cable at an incredible 4000rpm. The mower can cut grass at around 15mph, more than double the flat-out speed of the original HF2620 from which it is derived. Based on feedback from Honda Yuasa Racing drivers, three times BTCC champion Matt Neal and reigning champion Gordon Shedden, the mower features a custom-made paddle shift six-speed gear system. Additionally it has a custom-made Cobra sports seat, a Scorpion exhaust system and a steering rack taken from a Morris Minor. The result of this remarkable feat of engineering is a lawn mower set-up and geared to achieve a top speed in excess of 130mph, weighing just 140kgm, producing 96Nm of torque and an incredible PTW ratio of 532bhp/tonne. In testing to date the mower has topped 100mph on a circuit, belting out a remarkable 130db at three-quarter RPM and 98db at idle. 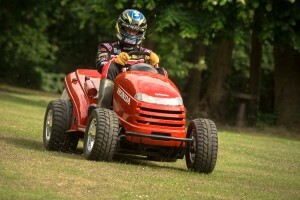 Mean Mower has already been put through its paces by reigning BTCC champion and Honda Yuasa Racing driver Gordon ‘Flash’ Shedden – check out the video.